While it's warming up (again) here in Atlanta, out on the planet Hoth, it's always cold. But no worries, I'm sure those thick, thermal clothes really breathe out on the battlefield as well. 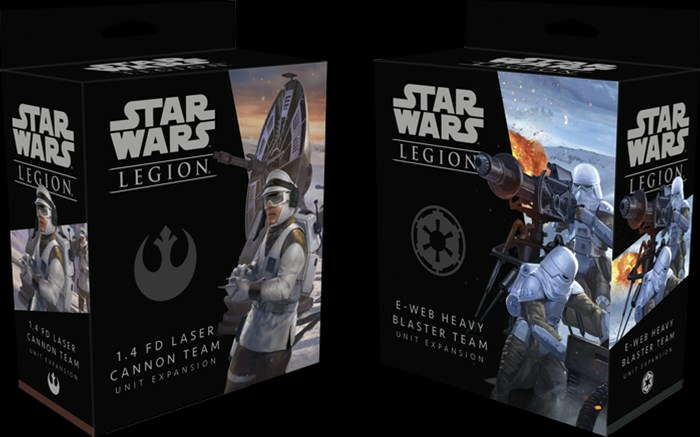 Fantasy Flight has announced two new sets for Star Wars: Legion. They're the Rebel Elites as well as the Tauntaun Riders (no word on how they smell). The Rebel Alliance is getting a boost today on the Star Wars: Legion battlefields. The Jyn Orso set, as well as the Rebel Pathfinders set, are both available now from Fantasy Flight. Fight back against the Imperial menace with stealth and cunning, striking from the shadows before heading back again. Being outnumbered and outgunned, the Rebel Alliance needed to have superior intelligence about enemy troop strength and movement if they wanted to win. That's where the Rebel Pathfinders come in. These scouts were able to go and get that intel, along with disrupt enemy detatchments. Soon, they'll be able to be added to your Star Wars; Legion armies. The Rebels have to be really resourceful if they want to stand any chance against the Imperials. Thankfully, they're good at recruiting extremely capable individuals. In Star Wars: Legion, these take the form of the Rebel Specilists. You can get a preview of this new box set coming soon in this preview. While we dont' yet have the AT-AT for Star Wars: Legion, that doesn't mean that everyone's on foot in the game. There are already a couple vehicles available, and Fantasy Flight is previewing two more, one each for the Rebels and Imperials. The Imperials are getting the TX-225 GAVw Occupier Combat Assault Tank, while the Rebels are looking forward to their X-34 Landspeeder (significantly beefed up from when we saw Luke driving one at the start of A New Hope). The Emperor, while certainly a master of the dark Force, is still in need of those to protect him when he goes out (he doesn't have a lot of friends). Those protetors come in the form of the Imperial Royal Guards, those red-robed sentinels always around him. In this preview, we get a look at what they'll be like when coming to the tabletops in Star Wars: Legion. The Rebels have their own scouts, out there looking for any weaknesses in the Imperial machine. Their use of cammo and covert tactics makes them perfect for it. In this preview for Star Wars: Legion, Fantasy Flight takes a look at a pair of new releases, Jyn Orso as well as a unit of Rebel Pathfiners. Much of the story of the Star Wars saga is the story of Emperor Palpatine. His rise to power. His maintenance of said power and expansion throughout. And finally, his fall. Soon, you'll be able to bring the Emperor to your tabletops in Star Wars: Legion. Get a look at this new commander option in this preview. While most iconically riding around on their Speeder Bikes, the Scout Troopers in Star Wars are just as capable on foot, infiltrating enemy positions, scouting enemy formations, and taking out vital targets at range with precision accuracy. In this preview for Star Wars: Legion, we get a look at the Scout Trooper unit and what various things they bring to your games.